So there are two major story lines for tonight’s Rangers game, either of which could make this the event of the night in the NHL. One is that the Rangers and Penguins are the best two teams in the Eastern Conference, and they’ll meet tonight with less than a month to go in the regular season. With Pittsburgh surging and the Rangers (hopefully) starting to regain their balance after a wobbly couple of weeks, tonight’s game offers a chance to watch two of the league’s elite teams, while giving those teams an opportunity to pick up two big points in the standings. The other story line, of course, is the return of Sidney Crosby. 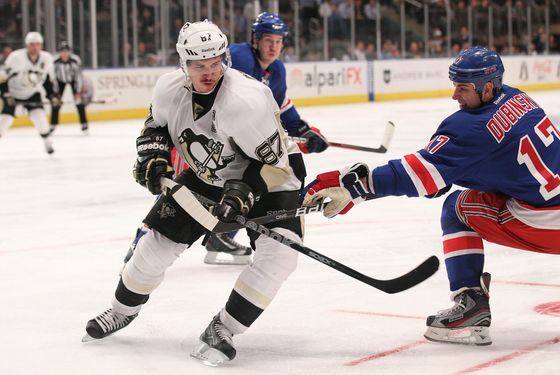 These things are very much related — Crosby’s presence figures to impact the battle for playoff seeding. We expect a lively, playoff-type atmosphere at the Garden tonight: Even if Crosby wasn’t making his return tonight — even if this was, say, his second game back — this would be one of the best matchups of the season. Which is why it’s a shame the Rangers won’t be operating at full strength: Via the Times, Henrik Lundqvist isn’t fully recovered after a bout with flu-like symptoms and won’t play, while Ryan Callahan and Michael Del Zotto won’t be in the lineup, either. Crosby will skate with Matt Cooke and Tylker Kennedy on the Pens’ third line tonight, thus easing him back into the lineup. (During today’s morning skate, Crosby also played the point on Pittsburgh’s top power play unit.) Of course, while the spotlight will be on Crosby, it's his teammate Evgeni Malkin who may very well win the Hart Trophy this year, and we have nightmares about this kind of thing happening again. Having said that, the Rangers newly formed top line of Brad Richards, Marian Gaborik, and Carl Hagelin looked pretty dangerous themselves on Tuesday night, albeit against last-place Carolina. Glen Sather said yesterday that he thought the Penguins — winners of nine straight games — were the best team in hockey. It’s his Rangers, though, who remain at the top of the conference heap, for now. Will tonight’s game definitively tell us who the best team in the East is? Not necessarily. The Rangers will be missing some key players tonight, and while the Penguins — who will also get Kris Letang back tonight — are finally healthy, this is still only the first game they’ll play with Crosby in the lineup since December 5. The hockey world will be watching tonight. Game time is 7 p.m.